An Armed Forces Day parade. 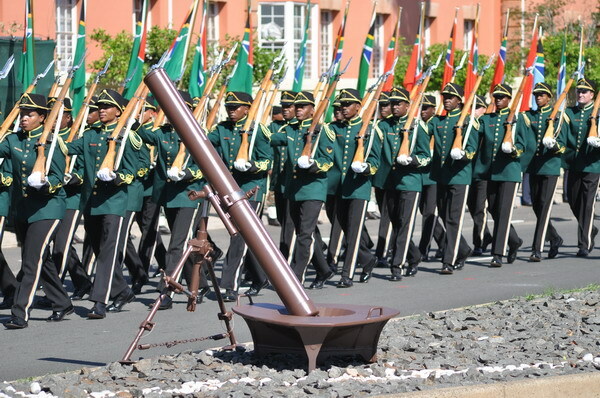 The SANDF planners, under the leadership of Rear Admiral (JG) James Matshimane (Director Naval Personnel) have been working for months with the City of Cape Town and the Western Cape provincial government. “It’s quite a major activity to get this coordination going and it’s a worthwhile thing to do,” Jamieson says. Capetonians can look forward tomany events not seen before at various locations around the Peninsula, many with panoramic views of Table Mountain. A Fan Park at the Mandela Park Stadium in Khayelitsha between 16 to 19 February will host numerous displays by the various arms of service, including the Rooivalk and Agusta A109 helicopters, allowing the SANDF to interact with the community as well as to create awareness regarding career opportunities in the SANDF. The V&A Waterfront will host a large number of SA Navy warships and a submarine for the public to visit on 16 and 17 February. These include the Valour-Class frigates SAS AMATOLA and SAS SPIOENKOP, offshore patrol vessels SAS GALESHEWE and the SAS MAKHANDA, Type 209 submarine SAS MANTHATISI, fleet replenishment ship SAS DRAKENSBERG and hydrographic survey ship SAS PROTEA. The South African Air Force will be contributing a wide variety of aircraft, including the Gripen and Hawk jets, C-130BZ Hercules and C-212 transport aircraft and Oryx, Rooivalk, A109 and Super Lynx helicopters. The aircraft will be flying out of AFB Langebaanweg and AFB Ysterplaat, but the SAAF will also provide a show-of-force by flying formations over the wider Western Cape Region, including the North West and Southern coasts. There is even the possibility of SAAF Museum aircraft participating. Other events include a 5/10km walk/run along the Green Point Promenade (16 February), sport development clinics in Khayelitsha (18 to 20 February), an interfaith service at the Cape Town City Hall (17 February) and a Gala Concert of combined military bands and choirs at the Cape Town City Hall (18 February). Does South Africa have a working synthetic aperture radar satellite?